Blending contemporary design with the natural beauty of its surroundings, the village-style Alila Ubud really makes the most of its unique setting. 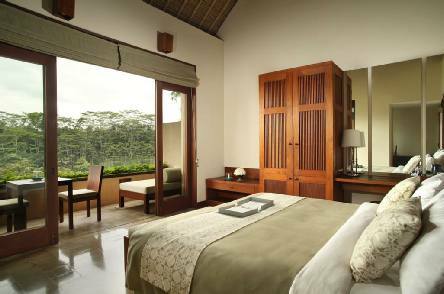 Rooms sit on stilts like tree houses and an award-winning swimming pool seems to float above the Ayung River valley. There’s a secluded, intimate feel and the service here is excellent. 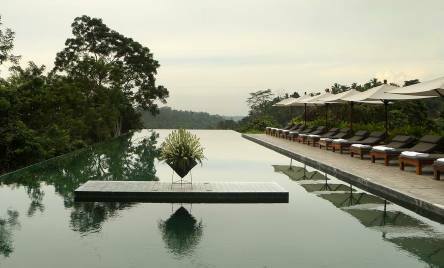 High on the edge of the Ayung River valley in Bali’s central foothills, 15 minutes from central Ubud by free shuttle bus. Rooms are scattered throughout the gardens. Superior Rooms occupy the first floor of two-storey buildings with wonderful unobstructed valley views, with Deluxe Rooms sitting below. Valley Villas have ‘floating’ bathtubs in the garden pond and are perched out over the valley with spectacular views, or within private gardens. For your own private pool, opt for one of the Pool Villas, which have a large private pool and an open-air bathtub set in the middle of a lotus pond. The Plantation Restaurant offers open-air dining under its traditional alang-alang roof and serves up a seasonal menu of authentic Balinese and modern western cuisine. At the centre, the bar offers a generous wine list alongside creative cocktails. Therapists at Spa Alila use ancient Asian healing techniques and age-old beauty recipes featuring the finest natural ingredients to stimulate, rejuvenate, balance and relax your mind and body. Visit during a new or full moon and you can enjoy moonlight remedies in the sculpture garden or on the banks of the Ayung River. 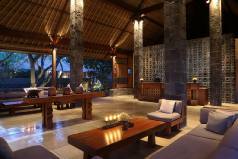 2019 Package holidays to the Alila Ubud, Bali Prices are per person based on two sharing.